Rivers State Governor, Nyesom Ezenwo Wike has reiterated his call for the decentralisation and depoliticization of security services as a way of resolving the deadly security challenges facing the country. 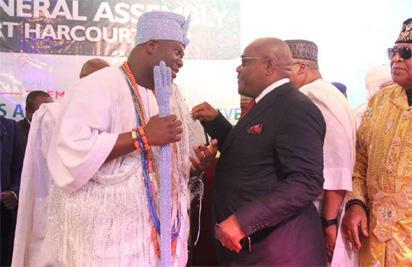 Rivers State Governor, Nyesom Ezenwo Wike (r) and the Co-chairman of the National Council of Traditional Rulers of Nigeria, Ooni of Ife, Oba Adeyeye Enitan Ogunwusi during the 9th General Assembly of the National Council of Traditional Rulers of Nigeria on Tuesday in Port Harcourt. The governor noted that that the security services as presently constituted cannot address the security challenges facing the country, where lives are wasted regularly, while governors are helpless. Speaking during the 9th General Assembly of the National Council of Traditional Rulers of Nigeria on Tuesday in Port Harcourt, Governor Wike said that the Rivers State Government has taken steps to improve her security through the setting up of a neighbourhood watch. He said: “For us in Rivers State, our position on State and community policing is very clear. While we join our voices to other well-meaning Nigerians to strongly and emphatically demand for the decentralization and depoliticization of security services, we are also not resting on the back of helplessness to do nothing. “And even as we may continue to live in denial, the recurring bloodbaths in Benue, Taraba and other States have once again exposed the weaknesses of our country’s centralized policing system as well as the frustrations and near complete helplessness of State Governors in their quest to provide adequate security for the communities and the people that they govern. Governor Wike said that at a time like this, it will be ungodly for good men to remain silent while the nation is dangerously wobbling. He urged all well-meaning persons to be counted among those who will work for the resolution of the security challenges facing the country. He said that Rivers State is peaceful, working and brimming with ample economic opportunities for investors to take advantage of. The governor said the traditional institution must wake up to their responsibilities by lending their strong and respected voices to the national agitations for true federalism, resource control, greater devolution of powers, as well as State and community policing and good governance in the country. Declaring the 9th General 9th General Assembly of the National Council of Traditional Rulers of Nigeria open, President Muhammadu Buhari stated that his administration will take steps to promote security of lives and property. He noted that security challenges seem to be deliberate and an attempt to undermine the nation’s territorial integrity. Represented by the Minister of Interior, Lt General Abdulrahman Danbazzau , the President said that he is saddened by the wastage of human lives in different parts of the country. He directed security agencies to identify and bring to book all those involved in deadly crime. In a Keynote Address, Inspector General of Police, Mr Ibrahim Idris said that the police alone cannot tackle insecurity without the support of traditional rulers and their subjects. In his address, Chairman of the National Council of Traditional Rulers of Nigeria, Sultan of Sokoto, Alhaji Sa’ad Abubakar requested governments at all levels to work towards enhancing security. He urged the traditional rulers to take the camaraderie that exist in the forum to their respective communities for national peace. Chairman of the Rivers State Council of Traditional Rulers, King Dandeson Jaja said Nigerians must rise above partisan consideration in the quest for peace. Co-chairman of the National Council of Traditional Rulers of Nigeria, Ooni of Ife, Oba Adeyeye Enitan Ogunwusi urged Nigerians to keep politics aside, engage in peer review on ways to develop the country. The post Governor Wike calls for the decentralisation of security services appeared first on Vanguard News.